Carbon monoxide is a colorless, tasteless, odorless and highly toxic gas. 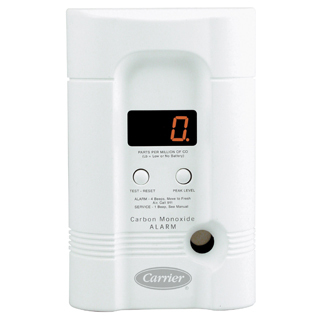 The Carrier® CO alarm uses sophisticated sensor technology to detect and record levels of CO.
You can monitor the current CO level in your home on a large, easy-to-read digital display. When dangerous levels of CO are present, a loud, audible alarm alerts you and your family automatically.